"Mummy, we love you and we love your baking..." - love hearing these remarks too. This fantastic cookie recipe originates from Pioneer Woman and in her post, she has suggested eating these cookies in a form of ice cream sandwich but we are loving these cookies simply on their own. 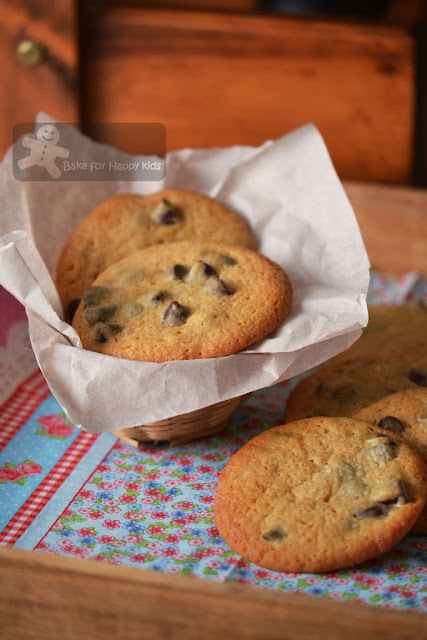 Although these cookies looks like some of the chocolate chip cookies that I have baked previously (please refer to my cookies recipes list), they can be quite different in term of their texture and taste. These freshly baked Horlicks (or any malted milk) containing cookies are crispy on their outside and chewy on their inside. 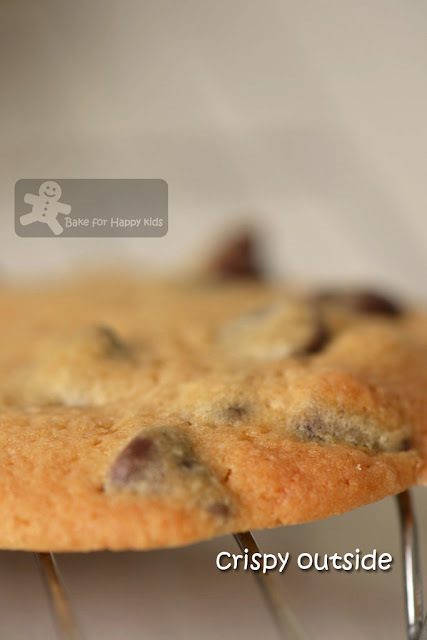 When the cookies are completely cooled, they become more chewy with lots of milky taste... Simply delicious! This Pioneer Woman malted milk chocolate chip cookie recipe has been also baked by Phong Hong at this post and Diana at this post and they all like these cookies too. To order to involve my boy for this bake, we were using our "piggy" spoon to mix the cookie dough. After the addition of malted milk, the mixing of this sticky cookie dough can be tedious and my boy had spilled a spoonful or two dough. He was actually very upset about it. Poor thing! Lucky that eating these freshly baked cookies had managed to cheer him and he actually ate five of these at one go! Can't wait... Are these cookies ready? Update on 29 March 2017: We love these chewy milky chocolate chip cookies so much that I have to bake these cookies again! I have incorporated a mixture of milk and dark chocolate chips into the cookies. Preheat oven to 375°F or 190°C or 170°C fan forced. Using a wooden spoon or an electric mixer with paddle attachment, beat butter and both sugars until fluffy. Add egg bit by bit and beat after every addition until well incorporated. Add vanilla and beat until combined. Then, add malted milk powder and beat until combined. 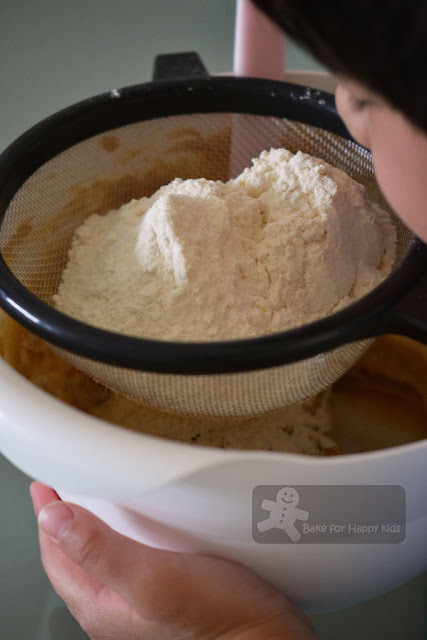 Sift flour, baking powder and salt into the butter mixture and use a spoon or spatula to mix until just combined. Stir in chocolate chips. 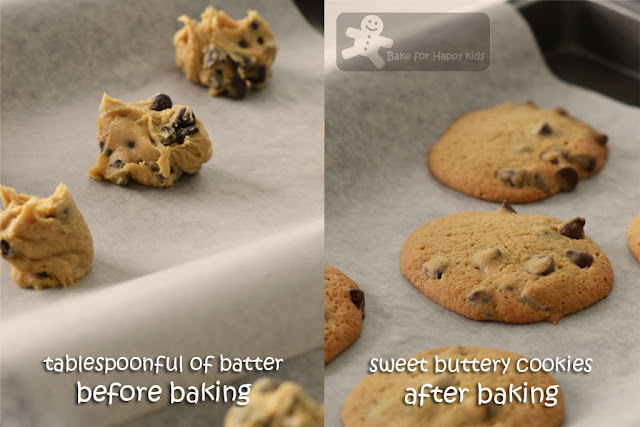 Drop by teaspoonfuls (or use a cookie scoop) and bake for 10-12 mins. 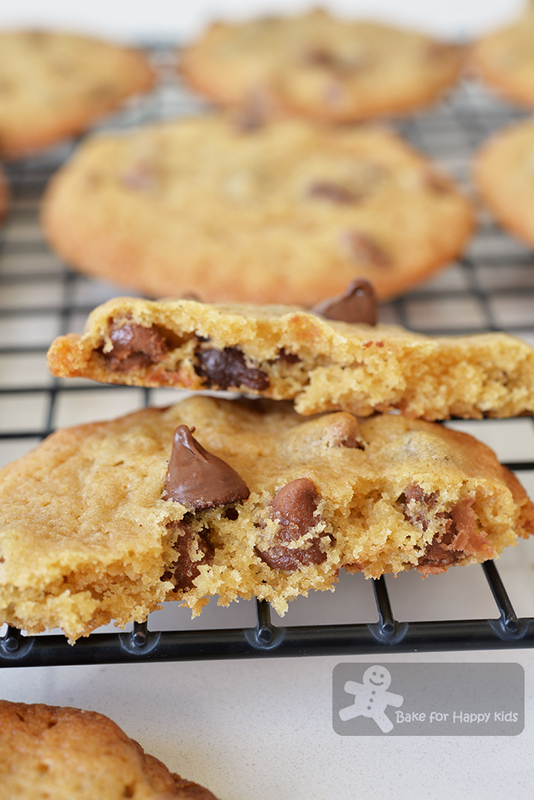 Bake less if you want chewy cookies; more if you want crispy cookies. 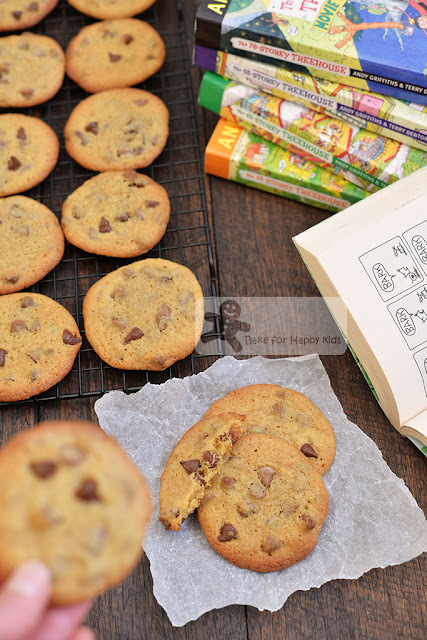 The cookies are more crispy when they are freshly baked and will become more chewy when they are completely cooled. Both textures are fabulous for enjoyment. Transfer cookies to a wire rack to allow them to cool completely. Store cookies in airtight containers at room temperature for up to 5 days. Yes, firstly I got get off some steam!! Well said, Zoe! Yes, those cyber bullies are nothing but a bunch of losers! It is not worth the time to go to their disgusting websites and pointless to feel bad about what they wrote about any of us, they just want to make us feel bad, so that they feel good, and we are not going to fall for that! Do not let their remarks get to you! Karma will soon catch up with them, what goes round comes around, totally! Nice cookies, have seen this at Phong Hong's. 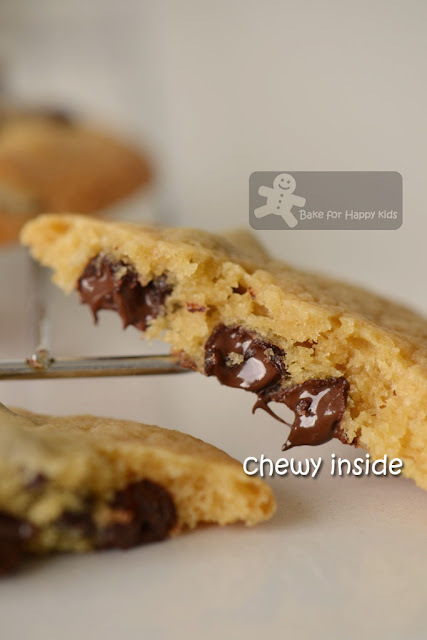 My kids do not really like chewy cookies, so I seldom bake cookies, and most of the Western cookies are chewy. I would like to try this one day, if I happen to have Horlicks at hand, again, nobody likes Horlicks in my house. 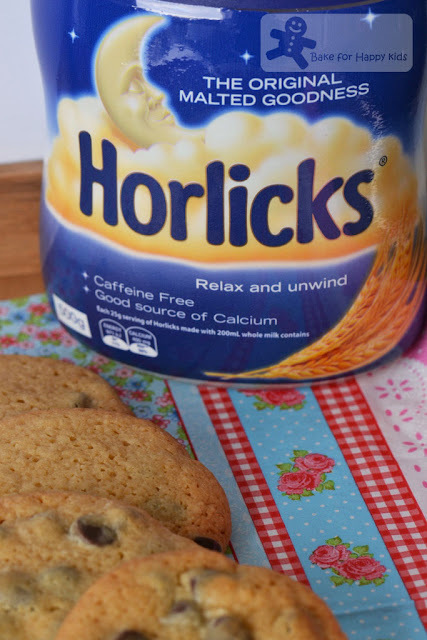 They might like this, as I think using Horlicks in cookies sounds good. Have a great weekend Zoe! High-five, Joyce! And say good bye to all these losers!!! - LOL! 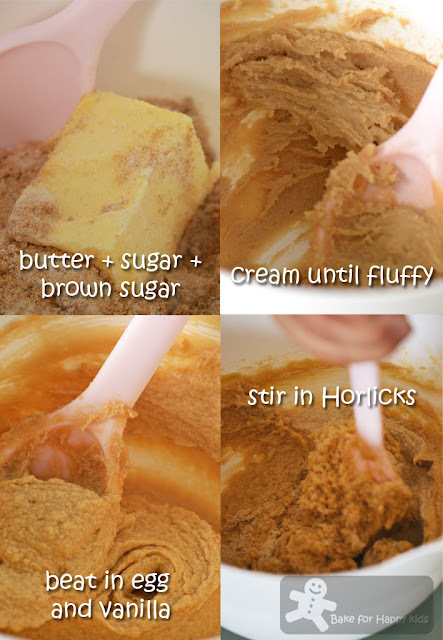 Using horlicks is actually a brilliant idea. I am definitely baking these cookies your way. who will say no to chocolate chips...but with horlicks... i have never tried before..
""Mummy, I love you and I love your baking..." My heart melts hearing this..- totally agreed. so sweet of them.. Yes, I believe in Karma too and Retribution. Not to worry, we bloggers stay united and are an awesome lot, cyber bullies are losers. Love the chewy cookies. Ignore those idiots, our love for baking and cooking stem from our love for our families, we want to serve them the best food avaialble, it is not as though we have nothing to do, we are very busy ladies...Btw, I am curious what those cyber-bullies did, pm me ok? Having difficulties to keep up with events and blogging... Me too and I'm still trying :p These cyber bullies are writing nasty remarks about my friend in their blogs and her blog, making her feeling very lousy... Nasty, isn't it? Best thing to do... ignore these people! They look silly behaving like these anyway. That jar of Horlicks reminded me of my childhood. Zoe, thanks for the mention. Your version looks very close to Ree's! Sorry about what happened to you. Those people are just terrible!! Dear Zoe, that is why they are called losers. They wanted to get attention. Just ignore them. We the good bloggers are more than them. Anyway, horlicks is my all time favourite drinks. Really thanks for this recipe. Am sure I will love it. And keep up the good blogging. I'm new to blogging. Have not encountered any cyber-thug or bullies. But it sounds quite scary... Anyway, what Joyce and Baby Sumo said are right. It's not worth the time and effort to pursuit it. Yes. They are just a bunch of loser. Let's ignore them. Let's continue to blog and share many nice things with real and friendly bloggers, whom share the same passion with us. I'm glad to know a bunch of nice and supportive bloggers. Thanks for giving me so much advice and tips! Really appreciate. I can see my baking and cooking have improved a lot. Zoe and the rest of the bloggers. Please blog more and share more for the benefit of your followers! i am saying No to cyberbullies, cyber thugs, cyber thieves..whatever you call them! Just do not understand is it really that difficult to credit people? Stealing people's work and photos for own benefit is highly unethical. As for the bullies, they will never know how bad it is unless they receive the same kind of harrassment.. I simply adore these cookies, I hope they made you feel much better from those cyberbullies, cyber monsters! Why must they act like this? Ridiculous! I love your blog to bits, Zoe. They must be really jealous of you to resort to this. Keep up the amazing work! By the way, these cookies look sooooOoo yummy ..! I can see why these would be yummy used in an ice cream sandwich - but I think I might get too carried away with just eating them on their own. They look So. Good. I completely agree about cyber-bullies, we should not let them hurt us in any way. Btw don't worry abt this people.life is a full circle.what one does returns back in this life itself.good or bad. Hey Zoe, stealing pictures is such a low thing to do!! And blatant too! Hope you are feeling less angry - these cookies are really yo die for!!! September must be a month to let off steam. I just did in my last post too. I received too many spams, and criticising just about everything...*sigh*. Zoe, I keep meaning to make these cookies but I always forget to get malt powder at the store. Doh! Now that it's fall I don't feel like eating any malted milk cookies. They seem like more of a summer thing to me. Maybe I could make malted milk brownies? Oh, and I'm sorry to hear about your photos being copied and used. So not cool. Karma will get them! Made these lovely cookies yesterday as i have a pack of horlick on hand given by my sister. I am shock to see there are people, a bunch of losers, instead of doing something productive and creative, they spend their time obsessively writing/backlashing in blogs devoting to one particular celebrity chef/ one particular person or stealing one's blog. They are targeting anyone who is supporting the person they are attacking. Yes I believe in Karma too. This is for the cyber thugs, thieves and parasites.